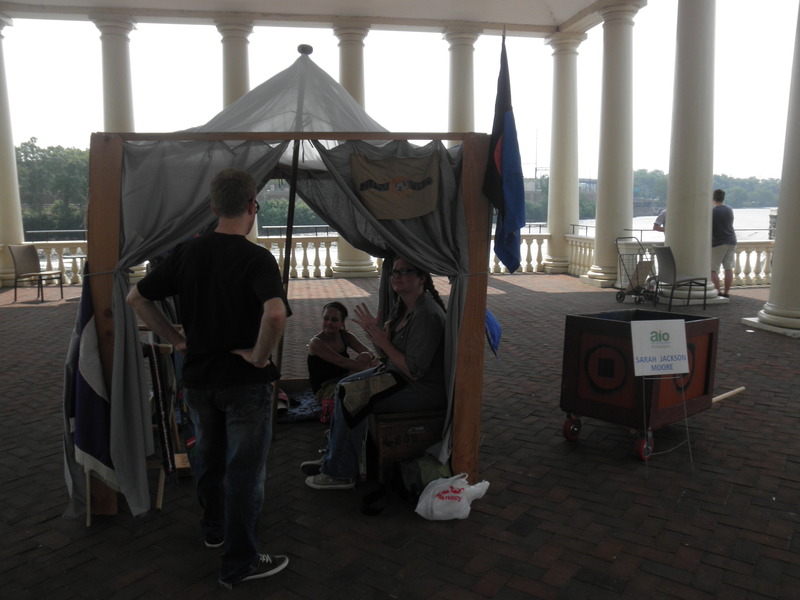 Sarah Jackson Moore and her tent that she sewed herself for Philadelphia Art in the Open. I’ve never taken the trolley to the ghetto. I’ve ended up in the ghetto by bus, by train, by car, by foot, but never by trolley. Friday night, I did. At the last minute, I decided to go to the Bright Eyes concert at the Mann Center of Performing Arts. This was quite a hike to northwest Philly. Too far to walk, and to take a bus, there were two transfers. However, the trolley stopped a mere four blocks away. So after work, I stopped at the apartment long enough to drop off my briefcase and I made my way to the trolley station. Unfortunately, I left the directions on the printer at work, so I was going completely off of memory, which is never a good thing. At least I got on the right trolley. Getting off at the right stop was a whole other thing. The Mann Center is on the edge of Fairmount Park, a wooded area. So I figured all I had to do was get off the trolley when I saw trees. Well, I never saw trees. All I saw was the West Philly ghetto. I took the trolley all the way to the last stop at 63rd St. I asked the driver if she knew where the Mann Center was. She said she thought it was at the 52nd St. stop, but she wasn’t sure. She said to get on the trolley heading back the other direction, which I did. I told the second driver my situation, and he knew exactly where the Mann Center was, and gave me directions. He didn’t even charge me for the second ride. As I said before, the walk was four blocks. Four long blocks. Regardless, I made it to the Mann Center for the Bright Eyes show. I got a ticket for $25 flat. A girl would later tell me that she bought her ticket online and ended up paying nearly $40 for the same tickets as me. A bought a beer and found a spot in the lawn area clear at the top of the outdoor theater. Just as I sat in the grass, Bright Eyes began playing the infamous intro to their new album, The People’s Key. Bright Eyes is one of those bands I always felt like I should know better, a little like Modest Mouse or Death Cab for Cutie. Bright Eyes frontman Conor Oberst is from Omaha, after all. But they never fell in my CD rotation. So Friday night I went to check them out. I mean, why not? They were good. They reminded me a lot of Wilco. Some trippy, alternative rock songs with a country twang. Oberst was able to morph from ballad to rock, and his entire band was extremely talented. The concert started at 9:30. At 11:30, they were still going, with no sign of stopping. Around 11, they started playing long, slow songs, and my eyes started drifting shut. Since I didn’t know any of the songs, I made the executive decision to pull the cord and leave. Outside the stadium there were a line of buses. They went directly to Center City. There were all white people on these buses. Saturday was another day of random events. 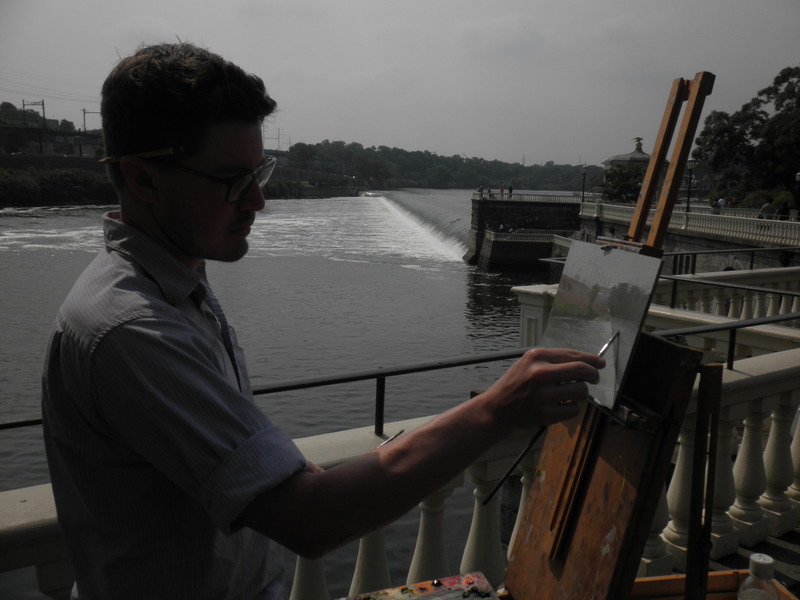 Zach Martin painting in the Philadelphia Water Works next to the Schuylkill River. A couple of friends, Sarah and Zach, were participating in Art in the Open. They were set up along the Schuylkill River trail with their art. I took $100 to hopefully support their efforts. I underestimated the value of my friends’ art. As it turns out, you couldn’t buy their pieces at the show. Later, the art will be shown in a gallery, when they can then be purchased. Zach, an oil painter, was actively painting scenes of the river. He was selling his paintings for $1,000. Sarah, on the other hand, works with fabric. She sewed all of the pieces of a livesize historical camp. I helped her tear it down at the end of the day, and it was a real bear. We went out for drinks and appetizers, and I was home by 9. Bored on a Saturday night, I decided to go to my standby, the North Star bar, which usually has local crappy rock bands playing. Except Saturday night the cover was $14. Apparently Australian sensation Lenka was playing. She had a minor hit in 2008 with “The Show,” which was featured in some commercials, but haven’t heard anything from her since. Lenka was a talented band. The singer, Lenka, also playing the keyboards, and played many of the songs with a keytar, which I had never seen used so effectively. She was extremely cute and playful on stage, with short red hair and a short leopard print skirt. She also had a cute voice, and performed well on her stage. Her supporting band was tight, and every member played several instruments, and sang back up. The songs were all similar, but they had a happy beat and quirky hooks. I was pretty drunk, but I cheered louder for Lenka than I did for Bright Eyes. I was so impressed, I decided to buy an album for $10. They announced that after the show Lenka would be signing copies, so I waited in line. I did cop out and had her sign it for Lisa. I don’t know why, but for some reason I felt a little weird asking for an autograph for myself. It kind of felt like the first time I asked a stripper to sign her poster. So I told Lenka that Lisa was a big fan of hers (Lisa has never heard of her), and that she was in Tokyo and sent me in her stead. “What a good boyfriend,” said Lenka. While I would recommend either band to anyone, for a good time, see Lenka. For long overwrought cerebral songs, go see Bright Eyes. And support your local arts.